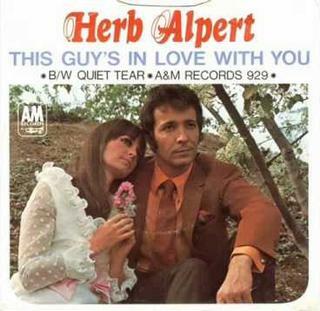 As I write this on July 1, 2018, I realize that 50 years ago today, Herb Alpert sat atop the Billboard Hot 100 with the number one song in the nation. It debuted in April of 1968 after airing first on the CBS special, THE BEAT OF THE BRASS, and shot to number one in June of 1968, remaining there for four weeks. I remember it well. I was all of seven years old, and bought the single, which I still have. Mine didn't come with the picture sleeve though. I don't think I've seen that before. I did most of my record buying in a dime store then, and I don't remember seeing many singles with picture sleeves there. I'm not sure why. I don't think they removed them, since most had the manufacturer's sleeves, just not the picture sleeves. The album, BEAT OF THE BRASS, came out on May 1st that year, and I must have been content to wait for that to get the big number one song. If I recall correctly, I had audio-taped the TV special and replayed the song there for that week or so while awaiting the album. I never had the actual single for decades, but have it now, with a jukebox title strip and picture sleeve. I also have the Spanish version, "Yo Soy Ese Amor" and the Italian version, "Un Ragazzo Che Ti Ama". I've witnessed some fans here who aren't all that fond of Herb's singing, and that's their choice. I find the record quite special, even today. My parents gave me my first TJB album for Christmas in 1969, it was the "America" compilation. For my 11th birthday on January 4th in 1970 I got some money and rushed down to the music store on Oslo's main street Karl Johans gate only to find that I did not have enough money to purchase a full price album. I asked if they had some singles and it turned out they had two; This Guy's In Love With You and To Wait For Love. As I already had "A Quiet Tear" on the America LP I chose To Wait For Love. However, I did not know at the time that Herb was singing so I was quite disappointed with To Wait For Love but the flip side "Bud" was a small comfort. I first heard the song at my dad's store, where I filled in after school dusting shelves and putting incoming freight away, until 1971 when we started our little music store and I started mostly taking care of that. But hearing "This Guy" always puts me back into that era of my life. When we sold 45 singles, probably 75% of them came in plain-jane type label sleeves, and occasionally plain white sleeves. I had no idea that picture sleeves existed for virtually all singles (at least, in the '70s/'80s) until I started seeing pictures of them on Wikipedia. I assume the picture sleeves probably went to larger stores, or maybe only the first batches of pressings, things like that. Yes, I've heard it was the first pressings that got picture sleeves. If you were shopping for singles in dime stores, a lot of what you'd be seeing were the tail end of pressings... copies of records that were past their day as a hit and thus had the price reduced at the discount store. I well remember the song, the TV special, the first TJB concerts I attended...all 1968; especially the summer of 1968 - a very memorable time for me. That was the summer just before my senior year in high school. My older sisters started tuning our radio to pop music stations around 1970ish and 'This Guy's In Love With You' was one of the songs I remember hearing in those early times. I loved the laid back vocal that sounded as warm and relaxed as if Herb was falling asleep in the sunshine as he sang. I also loved the trumpet sound. We had two options of places to buy records in the one-horse town where I grew up. One store was filled with old washing machines, nuts, bolts and dust and had a few bicycles strung from the ceiling. A choice of four or five singles could sometimes be found in there. The other was an electrical appliance store but actually had a few racks of singles and albums that you could sift through. Demand for the records must have been so low that some of the records must have been sitting there for ten or fifteen years. Old singles that I bought there included 'Stuck On You', by Elvis, 'In The Middle of Nowhere', by Dusty Springfield, 'Break My Mind', by Roy Orbison, and 'Surrender', again, by Elvis. I remember seeing Herb Alpert & Tijuana Brass singles there but my pocket money obviously didn't stretch that far. Holidays at my Auntie's and Uncle's, where a cousin fifteen years my senior had already left home and left part of his music collection behind, allowed me to thrash such singles as The Beatles' 'Eleanor Rigby' and 'Norwegian Wood', Petula Clark's 'Colour My World', The Small Faces' 'Itchycoo Park', The Groop's 'Woman You're a Breaking Me' and The Randells' 'The Martian Hop'. I must say, that older cousin had good taste in music, (perhaps with the exception of The Ran-dells' 'Martian Hop)...... but no Herb Alpert or Tijuana Brass. The other was an electrical appliance store but actually had a few racks of singles and albums that you could sift through. Demand for the records must have been so low that some of the records must have been sitting there for ten or fifteen years. 68 was a crazy time, too. Riots, assassinations - remember my dad driving to work with a shotgun in the truck. And to top it off my brother was in Vietnam. The good part was the music, but we had to go 10 miles to find a record store.